Blur, sting, redness, itch, watering, irritation, fatigue, dryness, and contact lens problems, are all symptoms. We follow a systematic protocol for evaluation of severity. Your symptoms dictate a lot. Osmolarity and Inflammatory chemical content are tested. Insurance almost always covers these inexpensive office lab tests of tear fluids. Infection, if present, is cleared. Inflammation is attacked heavily, and if the osmolarity is very high, blood tests are sent out for Sjogren's syndrome testing. With that, a request is also made to see your internist or family doctor for testing. Follow-up visits assess response to therapy, results of testing, and insurance cooperation in coverage of medications. We do not want any products put in your eyes containing Benzalkonium Chloride [BAK]! We want to see great corneal tear film spreading with fluorescein, no corneal staining, no lid margin or conjunctival reddening, no crusting, and no Lissamine Green staining of the whites of your eyes. It may take a few visits to achieve your comfort level, but we are 97% successful utilizing, in stages: preservative free drops, ointments , prescription topicals, oral prescriptions, punctal insert plugs, Restasis brand cyclosporin, other form of cyclosporin, topical steroid. topical tacrolimus, tetracycline and erythromycin derivatives, and ketoconazole. To learn more about Dry Eye, visit eyeSmart.org. The increasing prevalence of dry eye disease is precisely why Yasgur Eye Associates became certified by TearLab as an ‘Accredited Dry Eye Center’. As an Accredited Dry Eye Center, the staff at Yasgur Eye Associates is dedicated to providing the highest quality of dry eye care by using advanced ophthalmic diagnostic techniques and treatments. 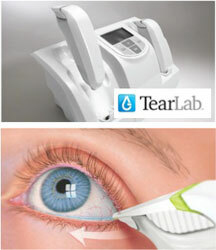 One of the latest devices in dry eye technology is the TearLab Osmolarity System. By using the TearLab, Accredited Dry Eye Centers like Yasgur Eye Associates can quickly and painlessly measure a small sample of a patient’s tears to determine how dry they truly are. 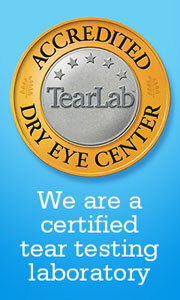 In fact, the TearLab is the first objective and quantitative test for diagnosing and managing dry eye patients. Using just a nanoliter of tear fluid, the osmolarity data that the TearLab gathers allows patients to understand their ‘level’ of disease. Your unique tear number will also allow your doctor to decipher the best means of treatment for you. If you’ve been experiencing recurring dry eye symptoms including: itching, burning and discomfort, be sure to schedule a TearLab test with Dr. Yasgur at Yasgur Eye Associates today. Yasgur Eye Associates specializes in diagnosing and treating dry eye disease. For your comprehensive dry eye examination, please contact our office today!